I am using your textbook for a class I teach for the Oklahoma City/County Health Department.I Love It!The class I teach is the Food Service Operator's Certification Course that is required by all food service operators in this county. I am a Registered Dietitian who is contracted by Oklahoma State University-OKC and Francis Tuttle to teach the class for the health department. It is kind of a community service offered by the two schools. I have only been teaching the class for three years now, and by far your book is the best. Your book has made my job so easy and so much fun!Some of my students are returning to do the re-certification class and bringing managers in who have not taken the class in 20 years.In the past, they have just challenged the test every three years, because they thought the class was too boring. (and theyknew it all). I would highly recommend this book to educators in the nutrition field. I think all nutrition majors need to know this important information. I also recommend it for a reference for my food service managers in my nursing homes and assisted living facilities. As an instructor who teaches Food Safety classes to front-line employees, I find this text an excellent resource. It is comprehensive yet still easy-to-understand, a difficult combination to achieve for some of the technical aspects of foodborne illness, pathogens, etc. The cartoon-style drawings add to the enjoyment. I have had many trainees who share these positive comments. Only negative comment would be to include color photos instead of the old, grainy B&W. 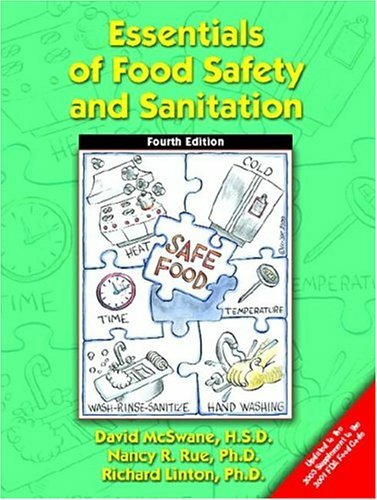 Also recommended for the Food Safety Trainer: "Keyword Index: 1999 FDA Model Food Code"
Essentials of Food Safety & Sanitation is a comprehensive, easy-to-understand guide to help food workers produce safe food. In my job as editor of a food safety-oriented newsletter, I review and have access toa lot of training materials, but "Essentials" is the one I referto the most for current, reliable information. I view this book as one of the essential resource books any serious cook should have. If I had named it, I would have called the book "On Food" because it is not just about cooking food, it actually gives you encyclopedia type entries to describe an enormous number of items in each chapter (e.g. fish, vegetables, meats). It will tell you where your food came from, in which seasons it is freshest, how best to prepare it and will follow each of these up with a number of recipes. Do not look to this book to be a cookbook, though. Is is more important to view the book as a resource to help you figure out the best types of preparations for that item you found at the market but have never used before. It is a great tool to just sit down and learn about cuts of beef and why some parts of the animal are great for one type of preparation versus another. That said, there are recipes and they are good, but to focus on them would be to overlook all of the education you can get from this book. 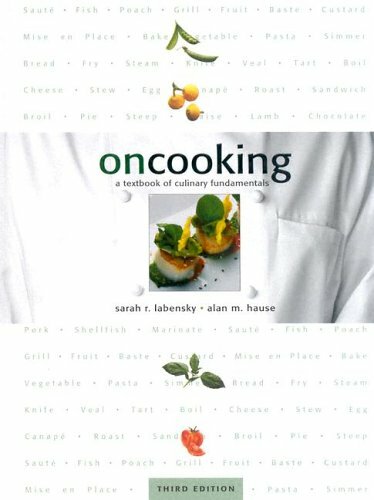 This is used as a textbook in cooking schools, and the set-up is like a textbook, but a lot more interesting than the ones you had in college or high school because you can eat after you learn. Simply blown away by how much info is in this book! I'm a culinary arts student at the Art Institute of California, and total foodie, and I take my cooking very seriously. This book goes into explicit detail for each and every ingredient and cooking method. I'm not kidding when I tell you that there are three paragraphs and a chart to tell you how to boil water. That may seem like overkill, but now that I've been following the various guidelines of food preparation, I notice a subtle improvement in everything I make. If you're the kind of person who walks down the spice aisle of the grocery store for fun (like me! ), or if you can't get enough kitchen gadgets (like me!) then you'll enjoy this book. Caution: don't read this one on an empty stomach! This book is a text for a class I am currently taking. While it covers all the basics, even the classics yet it also reflects how the cooking is today. The recipes come from a wide variety of sources and not just the school's own files. I am lucky enough to have studied under Chef Labensky. This is an outstanding book. This was our text book at Mississippi University for Women. We used it for everything. It gives great history, backgrounds, techniques, and recipes. My husband, Colley, (Which I met at MUW)and I still use it on a regular basis and we have been out of culinary school for 2 years. I highly recommend this book for anyone considering culinary school. This text is very thorough, and covers everything from history, nutrition and sanitation to classic and innovative recipes using the latest trendy ingredients. 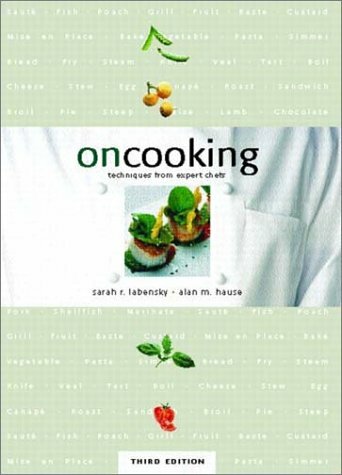 This text is geared specifically for the cooking student, however, with most recipes written to serve 12 or more, and ingredients listed by weight rather than volume. It will be tremendously usefull to add to a library of cookery books, and can be used to provide a solid foundation of the basic principals of cooking. Simply put, this is the most valuable resource you can have in your kitchen. It covers all bases, from scrambling an egg to duck pate to plating techniques. The only issue some may have is that all recipe ingredients are listed in weight, but the investment in a kitchen scale is well worth it. I became acquainted with this text from a culinary course, and I have used it again and again and again. Practical, easy-to-follow guide contains virtually everything consumers need to know about home canning: how to select, prepare, and can fruits, vegetables, poultry, red meats and seafoods; how to preserve fruit spreads, fermented foods and pickled vegetables;how to prepare foods for special diets, and much more. Also includes scores of simply written recipes that even beginners can handle (smoked fish, turkey-tamale pie, chicken croquettes, more. There are numerous books and literature that provide more information in a more in-depth format available to the home canner. Virtually all of the most recent processing time information (ie not 3-4 years old) can be found at your local county extension. Skip this book and spend your $ on the Ball Blue Book or Putting Food By (but make sure to use the most recent processing times). Contains all the information that you need to get started. An excellent reference book that will be around for years to come. 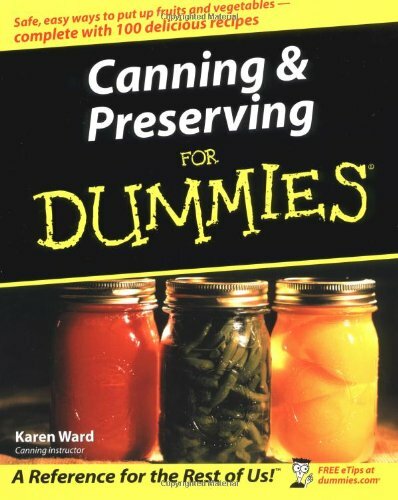 A few years ago I came across the first edition of USDA's "Complete Guide to Home Canning and Preserving" in a second-hand bookshop. At the time I had zero experience with canning or preserving -- both of which seemed, to me, to be akin to alchemy. The USDA's guide contained all the information I need to get started, and answered many of my questions about the process, the 'science' and my options (such as added pectin vs. no added pectin in jams) I recently acquired this edition of the USDA's guide. It has all the strengths of the first guide, with a few changes to better suit most modern kitchens. Most notably is the listing of measurements using cups and spoons; as opposed to the weight measurements used in the first book. The USDA's guide also provides objective, practical information about selecting jars, canners, storage, ingredients etc. I now have a few books with fancy, tasty canning recipes, but I always use the USDA's Guide as reference . . .especially when purchasing equipment or creating my own recipes. Thought about canning and preserving your own food? Maybe you haven’t given it a try because you believed it would be too involved. The truth is, today’s methods and procedures for home-canning, freezing, and drying food are simpler and easier than ever. And now, with this easy-to-follow book, you’ll get the information you need to can and preserve food safely. Makes Canning and Preserving a breeze! Tasty recipes, too! For thousands of years humans have enjoyed the taste and nutrition of fermented foods and drinks. We rely on the transformative, almost magical power of fermentation to preserve and improve all sorts of food, making them tastier, more digestible, and more appealing. Author Sandor Katz takes readers on a whirlwind trip through the wild world of fermentation. The book is divided into chapters that focus on particular types of food and Katz provides readers with delicious recipes-some familiar, others exotic-that are easy to make at home, including vegetable krauts and kimchis; sourdough breads and pancakes; miso and tempeh; beers, wines, and meads; yogurt and cheeses. The recipes provide a veritable smorgasbord of tastes, like homemade tempeh, sauerkraut, and borscht, along with a basic description of yogurt and cheese-making, complete with vegan alternatives.Whether you prefer to wash down your meal with Elderberry wine or Nepalese rice beer, there's something here to satisfy any palate. Should be read by every dedicated kitchen cook in America! With Sandor Katz's Wild Fermentation: The Flavor, Nutrition, And Craft Of Live-culture Foods as their guide, meal time dishes involving fermented and live-culture cuisines are not to be thought of as being restricted to gourmet class professional chefs. Most of us would recognize a great number of fermented foods (bread, coffee, chocolate, beer, wine, cheese, miso, yogurt, sauerkraut) that find their place in our kitchens and on our dining room tables. These are foods that depend on complex bacterial activity in order to be nutritional and palate-pleasing ingredients to our dining. What Sandor Katz has done is to compile a book that explores the history and politics of human nutrition, draws attention to world food traditions, and demonstrates the vital connection between natural, "live culture" foods and good human health. 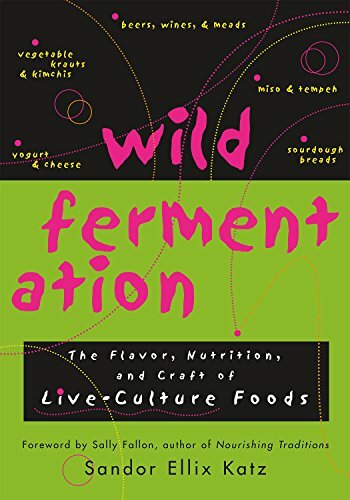 Wild Fermentation deserves a rightful place in any personal, professional, or academic Food & Nutrition reference collection -- and should be read by every dedicated kitchen cook in America! 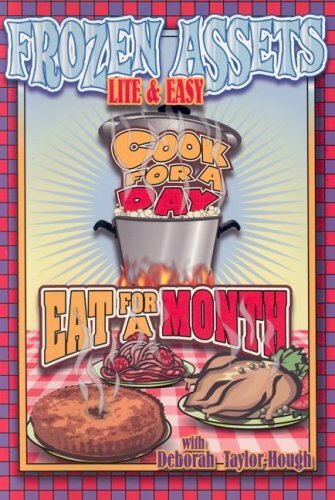 This is the only cookbook that I know of that you will read from cover to cover. It is not the dry "do this in this order" kind of book, it walks with you on your culinary endevors like your mom or grandma would, telling you stories along the way, including the secrets that make not just sourdough bread, but unforgettable sourdough bread. Sandor doesn't just tell us, he shows us, how to be self-sufficient about making and storing food (with little need for a stove or a refrigerator): making sourdough, cheese, miso, making tempeh, making wine, beer and, it seems, almost every other fermented food made the world over. And he gives you a list of resources where you can order the most mundane and exotic of starter cultures and even seaweed from our own Atlantic coast. And your concept of "self" will never be the same again. He shows us how to reclaim and restore a part of ourselves that has protected us like the ozone layer protects the earth: the world of microbes in and around us, the protective cloak of the microecology that is meant to be a part of us like our skin. Fermented foods restore a health balance like no probiotics and vitamins can. Happy reading, happy fermenting, happy eating! I used to cringe at just hearing the words "pickles" or "kimchi," as they immediately brought to mind spoiled cucumber and cabbage. After reading this book, however, I decided to give them another shot. Now, I feast on gorgonzola and tempeh as readily as I do fresh vegetables. My only complaint about this book, and it is a very minor, nitpicky point, is that it ignores concepts completely. I have tried to branch out from the recipes and make some of my own inventions, starting with fermentation of a head of lettuce that had been sitting in my refrigerator for eight weeks. A stomach pumping later that night quickly taught me not to stray from the script. Who knew the black liquid pouring forth would have been bad for me? I am surprised that Amazon published this review and then 3 months later censored it and then deleted it for 'PC' purposes. 'Wild Fermentation' by Sandor Ellix Katz appears like a living fossil of the sixties counterculture, surfacing after forty years of being both shaped and scarred by the currents and tides of the last forty years. The author is a member of a very sixties hippie influenced rural community whose lifestyle seems to be grown directly from the soil laid down by 'The Whole Earth Catalogue', 'Easy Rider', 'Alice's Restaurant', and the Hog Farm, but without any trace of the Merry Pranksters' antics or inclinations towards mind-altering drugs. The shaping of the last forty years is seen in the author's being HIV positive AIDs infected young man with a major interest in sharing his passion for fermented foods with the rest of the world through modern publishing and scholarly rigor. Fermented food products are probably much more common in our lives today than they have been since the advent of the processed foods industry. And, this is a fact that even the average foodie may not be conscious. A quick inventory of fermented foods commonly used in modern American homes will show how widespread they have become. The most obvious fermented product is beer, which has always been with us. Their cousins, wines and meads are also the product of fermentation. Virtually all cheeses are produced by fermentation, and our interest in and consumption of artisinal cheeses is rising fast. Yogurt is a close cousin of cheeses and consumption of yogurt has been rising since the early seventies. Sauerkraut and Choucroute have been with us since the beginning, but Asian fermented cabbage such as Kimchee and other fermented vegetables are becoming more popular. Pickles have also been a part of western cuisine for millennia Another part of the increasing interest in Asian foods is an increase in consumption of miso and tempeh, both from fermented soybeans. Asian fermented fish sauces from Thailand and Vietnam are also much more common today than they were 50 years ago. The granddaddy of fermented foods for Western cultures is yeast bread, especially sourdough breads. Fermentation has at least four beneficial results, two of which have been known since prehistoric times. The first and most important effect is that fermentation is a method of natural preservation by the creation of acetic acid (acid in vinegar) or lactic acid (acid from milk sugar). The second, represented most clearly by the brewing of beer, is in the action of microorganisms on sugars to produce ethanol (alcohol in beer, wine, and liquor). The third is based on our physiological salivation response to acidic foods, or even the anticipation of acidic foods, thereby making the mouth feel of these foods more succulent by the combination of natural food moisture and our own saliva. Ancients may have sensed the last beneficial result, but it probably has not been fully realized until the 20th century. This is the ability of fermentation to break down foods which were hard to digest into different products which are both easier to digest and more nutritious. The two best examples of this action are the conversion of soy carbohydrates into miso and the conversion of milk into yogurt. All of this has made fermentation into a darling of vegan advocates, as it broadens the range of useable non-animal protein and makes it all more palatable. 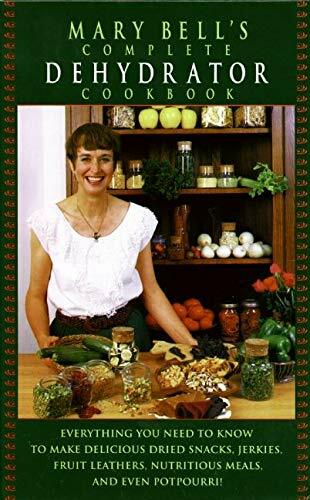 It has also made fermentation into a favorite of alternate lifestyle nutritionists such as Sally Fallon, the author of the excellent book 'Nourishing Traditions' who supplied a Foreword to this book. Fermentation is also one of the hallmarks of the slow food movement. Aside from the North African method for preserving lemons, I know of no other culinary methods that take as long to complete. Anyone who has made pickles, sourdough bread, or beer should have a very good idea of the times involved in fermentation. And this doesn't even get into some of the olfactory 'delights' that accompany the process of fermentation. The author covers all of the types of fermentation mentioned above, devoting the greatest amount of space to vegetable, bean, and dairy fermentation. 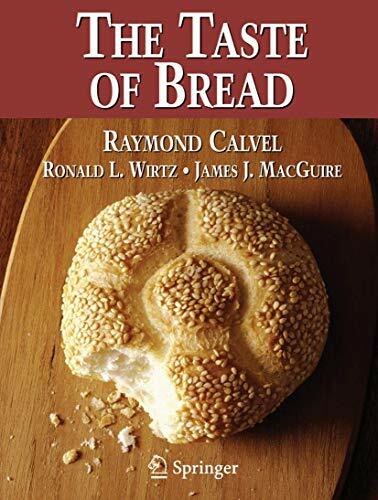 Bakers should not miss the lesser attention paid to breads, as for every book on yogurt, pickles, and kraut, there are ten books which cover artisinal baking with its sourdough sponges, poolishs, and begas. On the political front, the most active issue regarding fermentation is the issue of unpasteurized cheeses being imported into or made in the United States. It is truly ironic that the home of Louis Pasteur relishes their raw cheeses while the squeaky-clean US won't let it in. Aside from the thoroughly careful presentation the author gives of his material, the veracity of the book is strengthened by the extensively footnoted research behind his statements and the fact that the fruits of fermentation are essential to the lifestyle of the author and his comrades at their rural homestead. The similarity to both the hippie counterculture doctrines and the Amish lifestyle are unmistakable. One would almost take them for being scions of the Amish except for the names cited in the acknowledgments that I found myself checking against the names of the communities' goats. We owe this book in part to humans who go by the names Echo, Nettles, Leopard, Orchid, Spark, Book Mark, and Ravel Weaver. I also thank Echo, Nettles, Leopard, et al and author Sandor Ellis Katz for this deeply thought out exposition of a pervasive and growing part of the modern culinary and nutritional environment. Far from being a fad, food dyhydrating is one of the most ancient, effective, and nutritous ways of preserving food. Now, at last, there is a book that teaches absolutely everything there is to know about using an electric food dyhydrator to dry foods at home -- and gives more than 100 foolproof recipes for scrumptious snacks and meals made from dried foods. With this extraordinary book, you can learn how to cross junk food and expensive store-bought snacks off your family's shopping list -- and add to your cupboard homemade, preservative-free fruit leathers, candied apricots, beef (and fish) jerkies, "sun" dried tomotoes, corn chips, banana chips, and so much more! The "bible" for dehydrating foods. 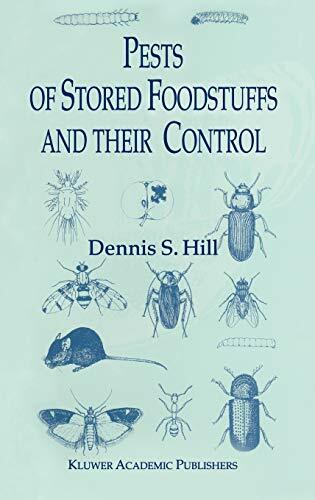 If you have a food dehydrator collecting dust somewhere, get this book and haul it out! 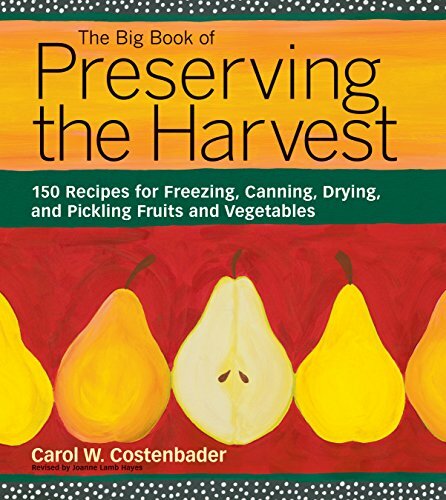 This is the best basic book I've seen for preserving foods through dehydration. Not only does she tell you what you need to do *before* you dry it, but she tells you what you can do with the stuff after it's dried. Recipes that are useable, recipes for camping, and some that will surprise you - this is a very comprehensive book. This is a must-have for backpackers who want every ounce to count, since dried foods weigh so little. A must for parents who read the "Fruit Roll-ups" label in horror: make your own fruit leathers! She'll tell you how to make fantastic beef jerky, too. 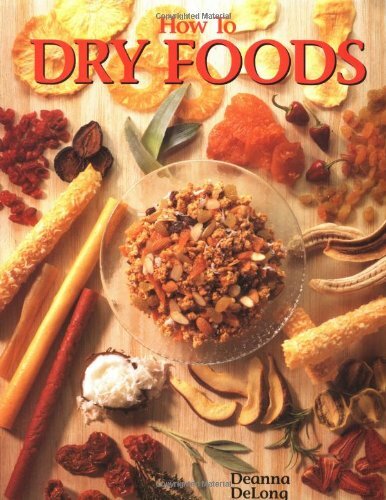 If you dry foods, you need this book. I bought this after I bought my dehydrator, although I would have bought a better dehydrator if I had read this before. This book gives several great reasons why you should consider a dehydrator, and how to make the most of it. I could have never imagined making a tofu cracker, for instance!! After I read it almost entirely in one night, I find it a great reference to go back to, whenever I'm considering dehydrating something new. I couldn't compare this with other titles on dehydrating food since I haven't read them, but I'm quite satisfied with this one. Addition of dehydrated pictures would be a great addition however. If you own a dehydrator, buy this book. It tells you everything you need to know (except jerky). For Jerky, you need her other book. Life in the outdoors revolves around food--cooking it, eating it, packing it, carrying it. We even fantasize about it, especially after a week of eating store-bought provisions. This book is all about fulfulling those food fantasies and avoiding those expensive disappointments. Trail Food tells you how to remove water from food, to make it lighter and longer-lasting, without removing its taste. Learn to plan menus and prepare meals just like the ones you left behind, using fresh foods from your garden or market, prepared and seasoned the way you like them. I've had this book for a few years now, and have read it cover to cover several times.It gives good advice on how to dry everything from plain vegetables to your leftover dinner.I even started to dehydrate my own eggs,and let me tell you they come back wonderfully.Great book that will have you tossing aside those $6.00 nasty premade meals. This is an excellent, concise guide to the process of drying as well as impetus to get the canoe onto the top of the car. While Kesselheim does give instructions detailed enough for the most persnickity among us, he also describes method, allowing the use of the imagination. Good tips, good recipes, wonderful guidelines -- and some memories to start the inner loon calling. Very glad I have this book. Time was, drying food was a real pain and involved an old stove and a lot of attention. Now, with the proliferation of dryers on the market, anyone can dry, meat, fish, fruit and veg. The problem is that, in a lot of places, The how of drying is still a closely guarded secret. No more. This is an excellent introduction to drying, and you don't need to be an expert to start either. Wanna dry? Get this book. Very clear advice for hanging onto your harvest longer. This is a great book for (food) gardeners and for people who have some land available to them. Although there are suggestions for "nooks and crannies" in your house, most of those ideas sound like ideas for older (draftier) homes. 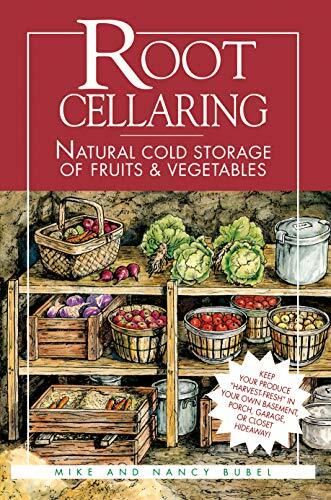 The suggestions for building your own working root cellar are clear, with illustrations to help you plan. There are lists of things that keep well and under what conditions to keep them. The authors even list certain varieties of (for instance) apples that keep better than others. There's a month-by-month plan of what could be coming out of your garden, going into the root cellar, and what could be canned or frozen. If you have a large garden, this is an incredibly useful book. However, those of us with smaller modern homes, smaller yards, and smaller, less heavily-producing gardens will be a little disappointed. As I read this, I came to the conclusion that it would be pretty darned difficult to have a root cellar on our property, because we don't have a useable cool north corner to put one in. Not impossible, mind you, it would just take a lot more effort, planning, and money to build it. I recommend this book highly for people who raise substantial amounts of their own produce. This book will really extend your harvest. With imagination and a little time and effort, you can have a root cellar that keeps your family in fresh food you grew all year long. This book is an excellent guide if you're interested in self-sufficiency. It gives the exact storage recommendations for a good number of fruits and vegetables, including which fruits and vegetables shouldn't be stored too close together. A Must-Have for Your Library! Outstanding book! The amount of information included makes this book well worth its price. The month-to-month calendar of what one can eat from their root cellar is especially helpful. The pictures, and descriptions, of several existing root cellars in various parts of the country was especially appreciated, and will definitely be utilized when I build my own root cellar. If you are interested in being self-sufficient, this book will be of great assistance. Like an earlier reviewer, I found that this book really suffered from being poorly edited. However, the recipes are delicious and the fat has been sensibly trimmed from most recipes. You can easily modify recipes to take out even more fat by using techniques like using cooking spray in a nonstick skillet for sauteing onions. Everything I have made from this book has been great, although I am jotting down lots of notes in my copy of the book as I have modified things a bit to suite my own style and experience. For example, her Cheddar Chicken recipe uses a very lowfat cheese sauce which is made without starting with a roux (flour browned in butter). I found it helped to use Wondra flour mixed in a jar with some of the liquid, like you would for gravy, instead of just tossing everything in the pan. This could cause clumping. She also has a crustless quiche recipe, but I plan on cooking it in a premade pie crust, with the extra fat and calories. I think my family would prefer that. I really like how she has organized her recipes into "mini-sessions" of 5 or 6 recipes grouped by protein type. So, for example, you might do a chicken (breast) session or a lean pork session in one afternoon or evening, rather than cooking for an entire month in one day. Slowly your freezer supply of delicious food will build up. I really, really do like this book, and having checked many freezer cooking books out of the library, this is the only one I bought. My chief complaint, however, is that it appears to have been rushed into print, and I lay the blame for this on the publisher, not the author. (This is just my theory, no one has confirmed it.) The author is a nice lady who deserved to have had support from her publisher. First, the shopping lists for each mini-session often list the ingredients in a different unit of measurement than they are listed in the ingredient lists in the recipes. For example, with the chicken breasts they are listed alternately by weight, number of whole chicken breasts, number of chicken breast portions (not immediately clear that these are different), and by cups of cooked and cubed meat. Chicken breasts vary considerably in their size, so buying them buy weight is more useful information for recipes where they are going to be cooked and cubed. Second, in some cases, the preparation instructions seem to have been copied and pasted without editing--e.g., boil skinless, boneless chicken breasts and then remove the meat from the bone? Third, the list of ingredients in the recipes are rarely listed in the order that the ingredients are used in the recipes. This is a convention that we cooks are used to, and it is disconcerting to have them listed out of order. A cook is more likely to make an error and omit and ingredient this way. Fourth, as noted in an earlier review, there are instances where the amount of some ingredients is given incorrectly. All I can say is keep reading the reviews here, and hopefully all major blunders will eventually be listed. I keep hoping that the author will post some errata information on her web site (you can find it easily in a web search), but it has not happened yet. Debi, if you read this, pretty please give us a "known errors" page! Great Money-Saving Book, But Poor Editing! I read about this book online and then checked it out from the library to see if I would actually like the recipes. I DID like the recipes (more importantly, so did my son and husband, both picky eaters) so I bought it used here at Amazon. The book has revolutionized the way I approach dinner and cooking in general. I'm not a very organized person, but when you have five pounds of ground beef in your fridge, you learn to be. I split up the "mini-sessions" and just made the meals that sounded good to us. WARNING: Most of the recipes are onion or garlic heavy, so if you don't like either of these ingredients, this book is not for you. WARNING #2: The book, while a lifesaver, is not well-edited, as others have mentioned. Wrong measurements for ingredients, omitted ingredients from the recipes or shopping list and there is one recipes that says "bake for 1 1/2 hours" but it doesn't tell me at what temperature! Overall, a great book, but read carefully and exercise your own culinary judgement! Love this cookbook! Everything's been great and the method is a life saver. Last night I tried the Chicken Tortellini Soup from Frozen Assets Lite and Easy. It was wonderful! I think we found a new family favorite. The title says it all Lite & Easy. My two new favorite words that help cooking for my family. A great cookbook! I have been canning and pickling for about 25 years. I bought this book a month ago and was pleasantly surprised that there could still be a book that could start in me the tickling and energy to start immediately and try all the preparations in the book. Along with Canning by Sue Deeming, they are the best books in Canning and Pickling I have encountered. The Big Book of Preserving the Harvest has many advantages. It has a lot of recipes. Not only how to can in water and a little salt, but delicious recipes. Each page is so well organized, that it becomes so easy to follow the steps. The variety is unique. The Freezing and Drying Chapters are not dry and frozen, but very alive with opportunities of relishing in scrumptious food delights. More surprises: each recipe has a Nutrition Chart at the bottom of the page. What more can one ask for? I was a little disappointed with this book. I got much more out of an old, old, old canning book I picked up at a garage sale. You'll miss a lot of important details and trouble shooting if your are just starting out canning/jam making and this is your only reference. If you've been laboring under the illusion that your grandmother just smashed berries into a jar or that pickles grew on exotic pickle trees, prepare to be enlightened with Linda J. Amendt's Blue Ribbon Preserves: Secrets to Award-Winning Jams, Jellies, Marmalades & More. Canning, as shown in this exhaustive edition, is as much a science as an art, and this book includes every detail to educate the uninformed on what it takes to make great preserves. Her recipes include the standards, such as strawberry jam, and the obscure, such as Garlic and Onion Jam. Amendt also does the public service of explaining the real difference between jams and jellies. Special caution about food safety holds a prominent place in Blue Ribbon Preserves and Amendt teaches us how to chose optimal foods for canning as well as how to safely store preserves to avoid potentially lethal food contamination. Be prepared for a bit of a chemistry lesson, which can be a long and sometimes didactic read, but it's well worth it for the critical food-safety information. I am quite impressed by this cookbook. It is extremely well written, very thorough and interesting. The author presents her information and recipes in a flowing, easy-to-understand style that makes this cookbook very user-friendly. She explains every step in detail without talking over the heads of people new to home canning or talking down to experienced canners. 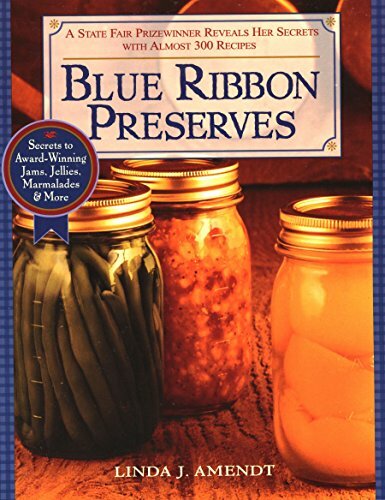 Unlike other preserved foods books, Blue Ribbon Preserves goes way beyond the basics. The author's special techniques and advice are invaluable and make home canning a wide variety of preserves easy for anyone. There is a huge selection of all manner of delicious recipes ranging from standard flavors to the exotic. The descriptions and instructions are so clear that every step is easily understood. While I personally do not have any plans to enter my preserves at fairs, the author's stories and discussions on fair competitions are quite interesting and informative. I have used her competition techniques to improve the quality of every preserve I make and serve to my family. For someone who does enter their preserved foods into fair competition and wants to win blue ribbons, the author's advice and insider secrets are essential. For everyone else - they will help you create exceptional preserves for gifts and home use. 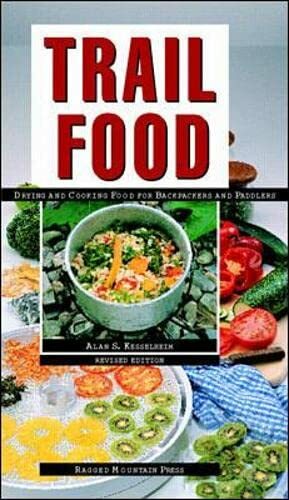 Best preserved foods book ever! Wow! What an impressive book. Linda Amendt sure knows her stuff - no wonder she has won so many blue ribbons! The Food safety information and canning instructions are outstanding. Not only does the author carefully explain the steps that need to be followed to prepare safe and delicious preserves, she also explains why each step in the canning process is so important. Nearly 300 excellent recipes, such as Peach Melba Jam, Tropical Peaches, and Sweet and Sour Plum Sauce, clear and easy-to-follow instructions and tips for success make this book a joy to use. 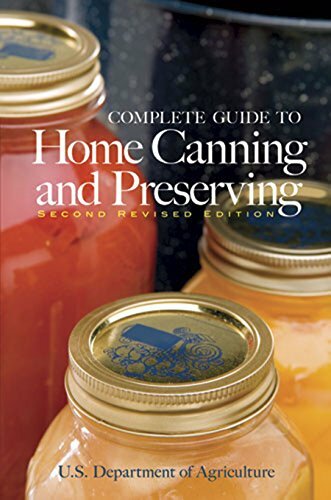 I highly recommend this book to all home canners - whether you are an experienced preserver or are trying home canning for the first time. You will be amazed by the wealth of information and great recipes it contains. - An A+ book! This is the best canning book I have ever read. Thank you so much Linda Amendt. Your receipes are wonderful and your advice is very, very helpful. Bravo! Please write more books for us to buy. I purchased this book a couple of months ago and have made her Santa Rosa Plum Jam and, just today, a batch of pear preserves. Both are huge successes! Linda's methods and recipes are clear and concise. Both recipes I have tried so far are absolutely delicious - for sure, I will be making more of her recipes. These are also great for gift-giving. Highly recommended! I found the educational portion of the book to be very useful - I have just taken a canning class and have tried canning in the past with success. I was looking for basic recipes that would be straightforward, tried and tested. The first recipe I tried, though, was not a success. It was fairly simple, though labor intensive. But the Apple Butter came out more like applesauce. I researched other Apple Butter recipes and found some extreme differences in the proportion of ingredients (apple pulp to liquid - cooking time - processing temperature) that were listed in the recipe in this book. In particular the 'Ball Blue Book - Easy Guide to Tasty, Thrifty Canning and Freezing'(revised edition 29) seems to have a better handle, give more precise information, and give better hints on cooking apple butter. This is the first book I recommend to my reader's. Stocking Up III is a concise guide for the beginning to experienced home food preserver. All methods are discussed, some in detail. One caution: the canning and pressure canning times need updating. An invaluable reference for gardeners who love to cook! Stocking Up is a thorough and practical guide to preserving AND cooking. It gives useful recommendations for the best preserving methods for specific foods, with step-by-step directions. Moreover, it gives many imaginative recipes for dealing with seasonal garden surpluses. Why not combine all those fresh ingredients into a hearty soup or main dish (to be savored on a cold January evening) rather than freeze them separately? I would rank this as comparable to the classic Putting Food By. This is a fantastic reference for drying food. The author takes the time to explain in detail the different methods of preparing food for dehydrating food. She discusses sulfiting, steaming, no prep. etc. The author also explains the various methods of drying food (oven, dehydrator etc.) The pictures only enhance the text. Further more, the author provides several charts (one for fruit, one for vegies, one for meat, one for herbs) regarding how well certain foods dry, how long each food will save when dried. I particularly liked the recipes that used dried foods. This is a great book to have if you are interested in drying foods. I constantly refer to this book every time I dry the extra food we have on hand. 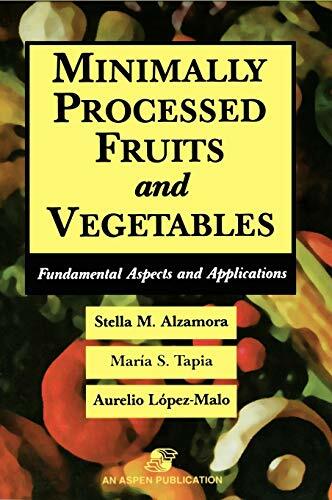 This book provides step-by-step instructions for drying fruits, vegetables, herbs and meats, along with tasty recipes that use dried foods. I loved the creative ideas for fruit roll-ups, a hit with kids of all ages! If you have a baby in the house, there are several recipes for making your own baby food! The author also gives references for different products on the market. 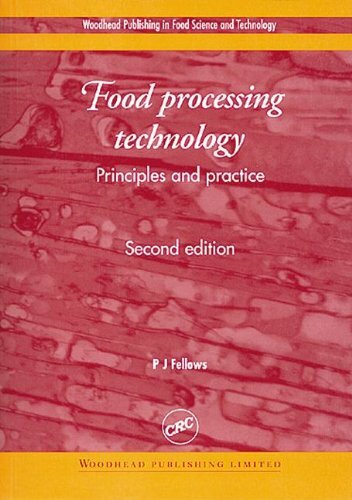 This book is easy to read and understand - a must for anyone who would like to learn more about food-drying. This is the best reference for drying foods on the market.